As we enter the second week of district play, there are several big match-ups around the state that will help determine playoff spots. First, let’s take a look at this week’s Kpreps top five rankings. As always, you can visit the Rankings page each week to view a complete list of the top five teams in each classification and how they performed last week. In Class 6A, No. 1 Lawrence improved to 7-0 with a 35-7 win over Olathe Northwest. Lions’ running back J.D. Woods became the schools’ career rushing leader with a 286-yard, four-touchdown performance against the Ravens. Woods now has 3,289 rush yards in his career. Defending champion Shawnee Mission East remains at No. 2 in this week’s poll after a 69-0 blowout of KC Harmon. Wichita Northwest remains at No. 3, but needed to outscore Dodge City, 52-33 to remain unbeaten. Derby is ranked fourth after a 40-point win over Haysville Campus, and Topeka High is back in the top five after a 41-14 win over Manhattan. The Trojans receive just enough votes to edge out Shawnee Mission West for the fifth spot in this week’s poll. In Class 5A, the only change in this week’s poll comes at the No. 5 spot where unbeaten Bonner Springs replaces St. James Academy after the Thunder’s 45-14 loss to No. 1 Mill Valley last week. Bonner Springs gets its shot at Mill Valley this week in a very competitive District 3. Elsewhere in 5A, No. 2 Bishop Carroll rolled over Maize 48-26 and should get a test from Maize South this week. Third-ranked St. Thomas Aquinas dominated Blue Valley Southwest 70-7, while No. 4 Pittsburg beat Blue Valley West, 56-13. District opponents Fort Scott and Paola move into the No. 4 and No. 5 spots, respectively, in the Class 4A-I poll. The Tigers beat Chanute 58-13 last week, while the Panthers beat Labette County, 55-14. Andover Central dropped out of this week’s poll after a 38-29 home loss to No. 3 Topeka Hayden. The top two teams remain the same this week with Bishop Miege ranked No. 1 and Buhler ranked No. 2. There are no changes to the Class 4A-II poll this week. Royal Valley remains in the No. 5 spot after an impressive 35-21 win over Perry-Lecompton. The top four teams posted big wins with Andale’s Zach Meyer rushing for 365 yards and six touchdowns in the Indians’ 59-24 win over Wichita Trinity. The Class 3A top five poll again remains unchanged this week as only No. 4 Halstead got a test from Kingman. The Dragons led 16-7 at halftime and scored twice in the fourth quarter to put away the Eagles 36-7. Halstead gets another test this week against undefeated Garden Plain. Top-ranked Rossville and No. 5 Silver Lake have one more tune up before their Week 9 showdown in the War on 24. The Troy Trojans became the first team in the state of Kansas to clinch a district championship with their win over Doniphan West. The fifth-ranked Trojans have completed district play and have clinched a first-round home playoff game. The Class 2-1A poll remains the same this week as top-ranked Meade went on the road and got a solid 33-18 win over Marion. Third-ranked Smith Center led traditional 2A contender La Crosse 14-8 at halftime before pulling away for a 43-8 win. The 8M-I top five also remains the same this week. All five teams in the poll posted big wins this week, but of note is Hanover quarterback Will Bruna’s performance against Lakeside-Downs. 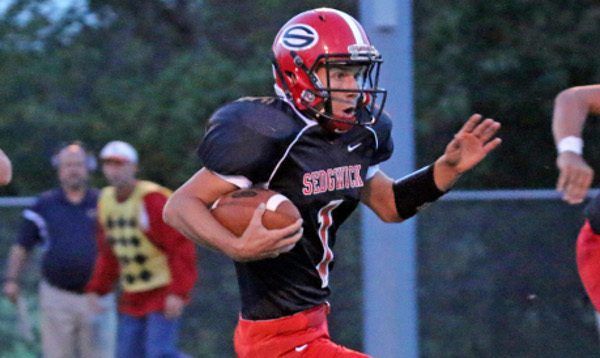 Bruna completed 13 of 17 passes for 282 yards and eight touchdowns – one short of the single-game state record. Big district showdowns highlight the Week 8 schedule including No. 1 Spearville hosting undefeated Hodgeman County and No. 2 Central Plains at No. 3 Solomon. In 8M-II, three of the top five teams posted shutouts on Friday. Top-ranked Victoria, No. 2 Sharon Springs-Wallace County, and No. 3 Argonia-Attica cruised to easy victories. Otis-Bison held off Beloit St. John’s-Tipton 46-36 to pick up a key district win. Axtell moves back into the top five poll this week after shutting out last week’s No. 5 Pike Valley, 22-0. Quarterback Colton Buessing returned from injury to help the Eagles beat Pike Valley.